This was one of my favorite cakes I've made for someone else. Talitha, who took our beautiful engagement photos, wanted a birthday cake for her daughter's 10th birthday party, with a Wizard of Oz theme. According to Talitha, all the little girls at the party were showing the cake to their moms and asking if they could have one for their birthday. I loved making this cake, partly because Wizard of Oz was a favorite movie growing up, and a movie my mom loved, too, and partly because her concept for the design was exactly what I would have wanted to do if it were my idea, which is a more abstract rather than literal translation of the film. 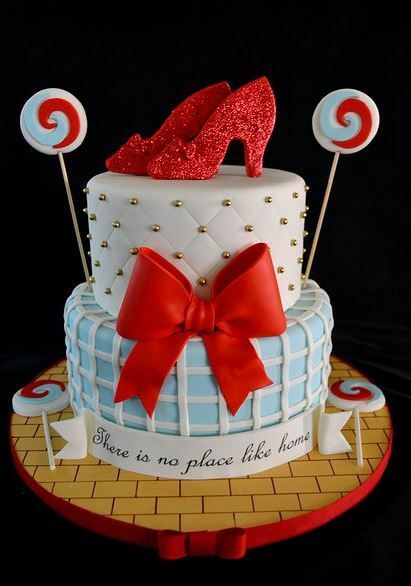 So instead of a cake that looks exactly like, for example, The Emerald City, it's simply suggestive of Dorothy's dress, with the blue and white cake that's accented with red. With little red polka dots that are actually flowers, a red bow, and of course the shoes covered in red sparkles, which I made a little more doll-like since the birthday girl is also an American Girl fan. A blue gingham ribbon (the only non-edible aspect) tied the whole theme together, with a pretty gold cake board to symbolize the yellow brick road. Marin had requested yellow cake with vanilla frosting, so I took a chance on a recipe I'd been working on for a from-scratch yellow cake, which was met with rave reviews, one of which was, "It tastes like the most amazing sugar cookie I've ever had, only in cake form!" 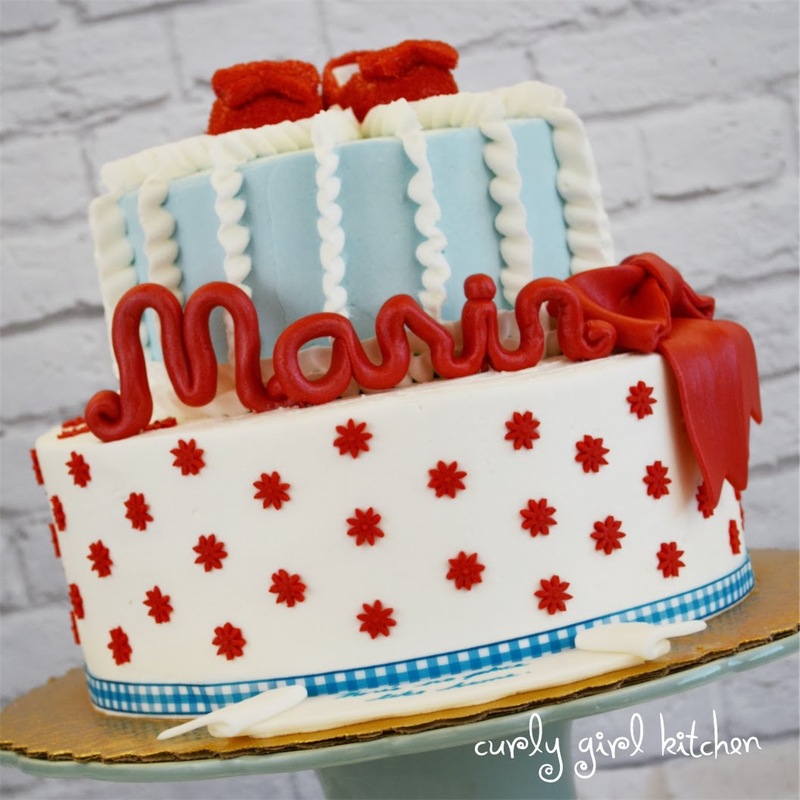 The party itself that Talitha put together was adorable, with a paper tornado swirling from the ceiling fan, red stripey straws and blue cups, with all the kids dressed up like characters from the movie, and Marin dressed as Dorothy herself. I remember once going to a play of Wizard of Oz with my mom, and begging to wear a blue and white gingham dress I happened to have. I asked my mom, "Do you think they'll think I'm really Dorothy?" Baker's Note: This makes a lot of cake batter, sufficient for two tiers. For a single tiered, 3-layer cake, cut the recipe in half. In the bowl of your stand mixer fitted with the paddle attachment, beat the butter, cream cheese and sugar for 5 minutes until light and fluffy. Scrape the bowl down and beat in the eggs, one at a time, beating for a minute after each addition. Beat in the vanilla. In a separate bowl, combine the flour, salt, baking powder and baking soda. With the mixer on low, add the flour mixture in three additions, alternating with the buttermilk, starting and ending with the flour; mix just until combined. In the bowl of your stand mixer fitted with the whisk attachment, beat the shortening/butter for one minute. In a separate bowl, combine the powdered sugar and meringue powder, adding by spoonfuls to the shortening until mostly combined. Add the extracts and the whipping cream and whip on medium high, scraping the bowl down occasionally, for 4-5 minutes until very light and fluffy. First things first, if you've never assembled a tiered cake, do some research. It's easy, you just need to use the proper support system. Here is a simple, photo tutorial by Cake Girls. 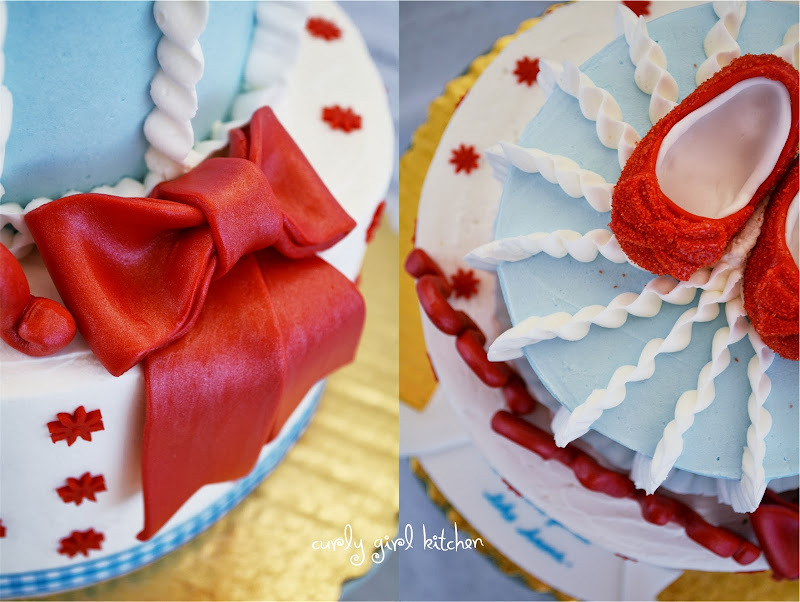 For the red bow, I kneaded red food coloring into fondant, rolled it out to 1/8 inch thick, and cut strips which I shaped into a ribbon. I set it on the edge of a cake pan, with another behind its back, so that it would dry in the position I planned to place it on the cake. I mixed a few drops of vodka with red luster dust and painted it onto the bow to give it a pretty sheen. 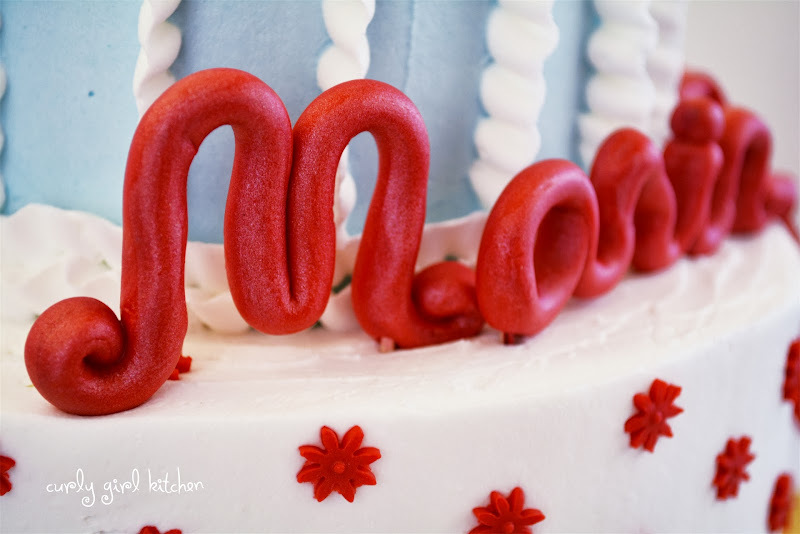 For the name, I rolled red fondant into a long tube with my hands, then simply shaped it into the letters like handwriting, inserting a few toothpicks into it before it dried, to support it in the cake later. I dried it flat on a parchment-lined baking sheet, then brushed it with some of the red luster dust/vodka mixture. 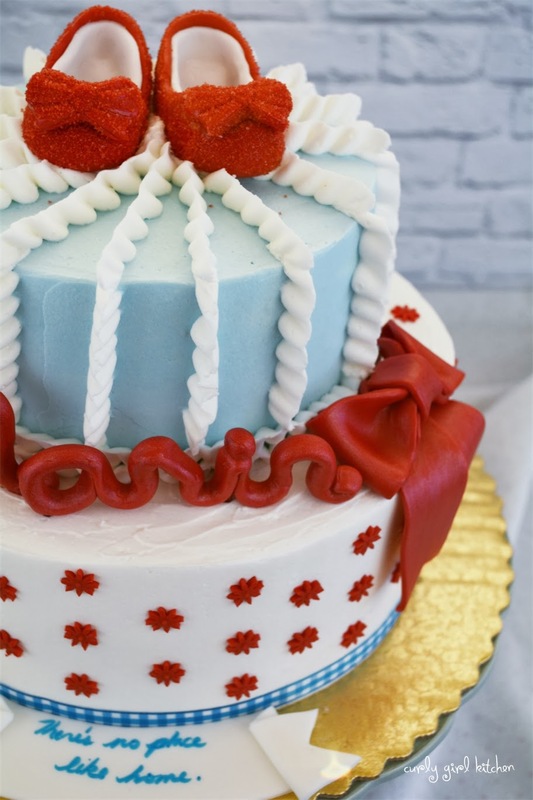 For the banner at the bottom, I simply rolled out white fondant, cut it in a curved strip using the edge of a cake pan as a guide, snipped the ends and folded them over. After drying flat, I used a blue edible marker to write, "There's no place like home." For the shoes, there's no easy way to describe my method. 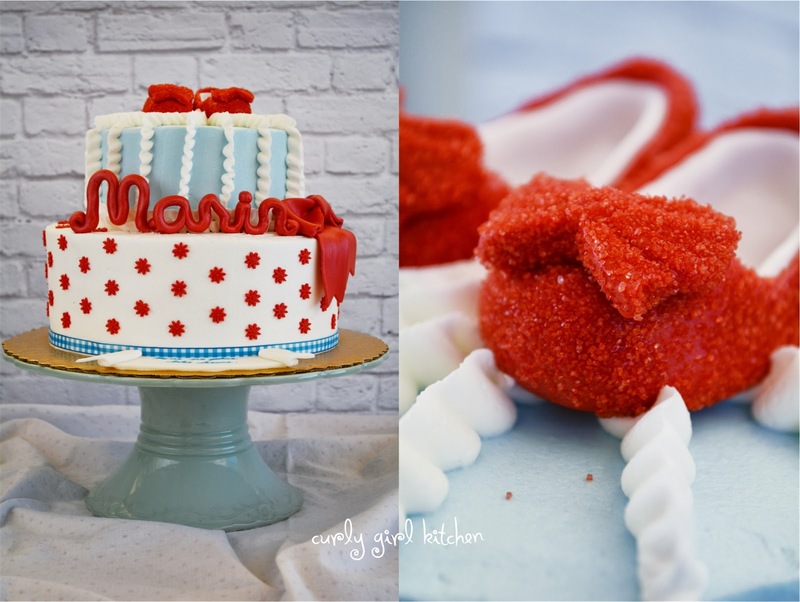 I took a small ball of red fondant and just started molding it (like play dough) until it looked like a shoe, and then did another one trying to make it look as identical as possible. I have a little bow mold that I pressed fondant into to make the bows, attaching them to the shoes with a few drops of water. 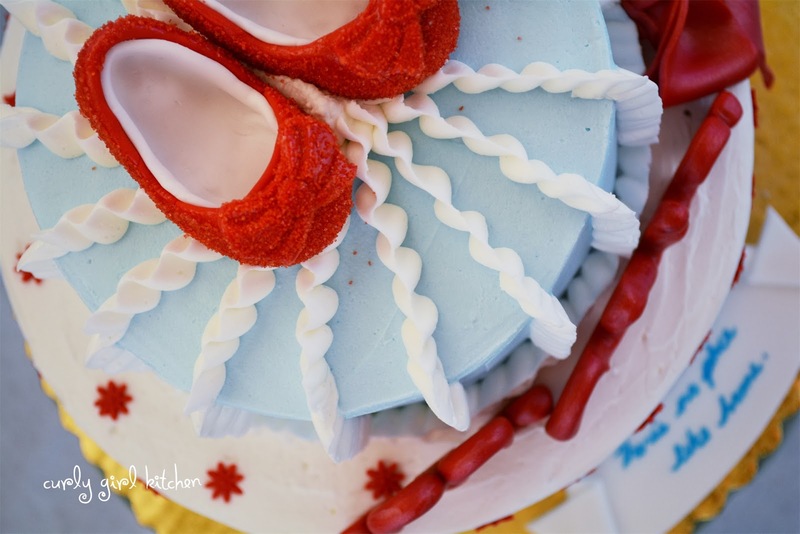 I made them look a little more like doll shoes by rolling out a circle of white fondant and lining the inside of the shoes with the white. 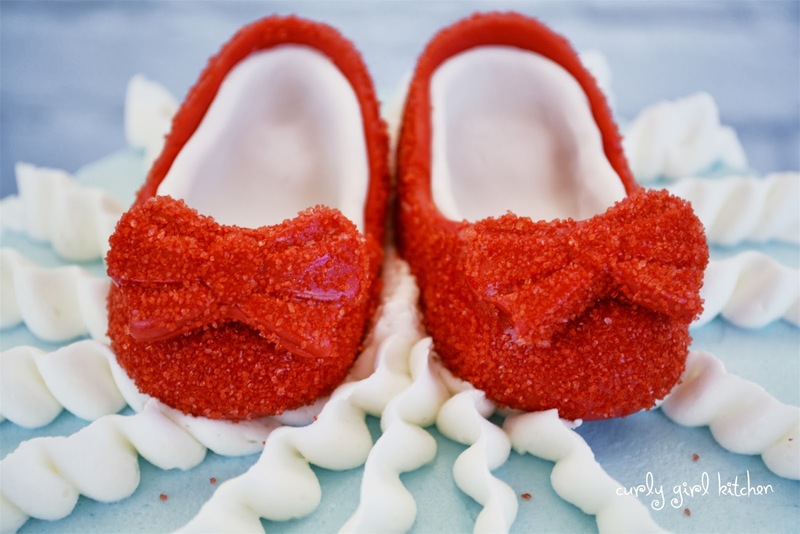 Lastly, for the dramatic sparkle, I brushed the dried shoes with a little clear piping gel, then sprinkled them generously with red sparkling sugar (holding them over a bowl to catch the excess sugar). The sugar will only stick to the gel and nothing else. For all the little red flowers, I rolled out red fondant and used a small flower punch/cutter. 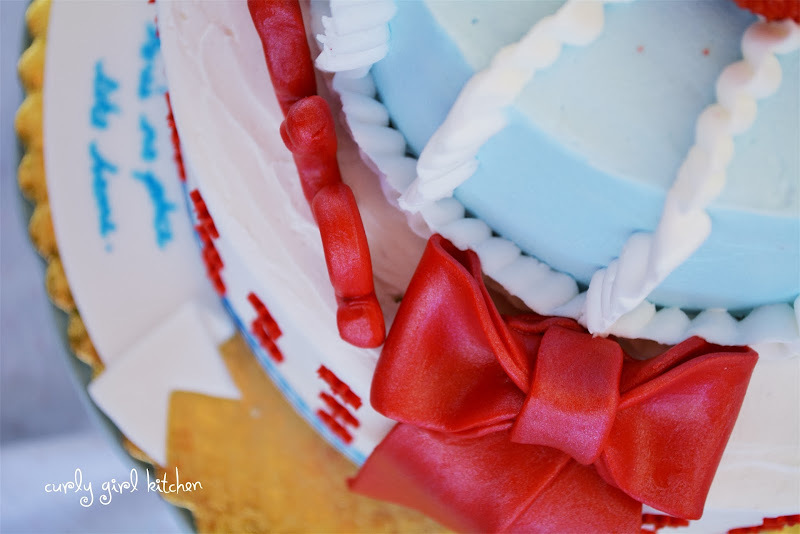 After frosting and decorating the cake, I gently wrapped the blue fabric ribbon around the base of the cake, securing it in the back with a straight pin; don't forget to remove the ribbon and pin before cutting. Everything else is edible! A little design inspiration from this cake.